Size 8/10 - $40.99 Only 7 left! 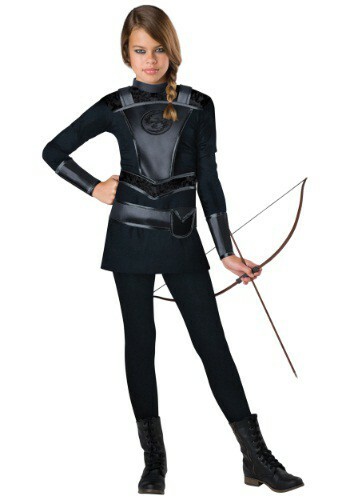 Oh, your young lady looks like she’s coming down with something...we hope she’s not catching...fire! Thank you for humoring us. We really need it sometimes. Anyway, is your gal ready to start fighting for freedom? If she is, don’t worry, you’re not doing anything wrong. Tweens need a little space and independence. We’re not saying you’re the strictest parent in the district, or anything; your kiddo is just asserting her free will and fierce nature. It’s healthy. It’s respectable. It sounds a lot like this really brave huntress we once knew in a different (slightly dystopian) land. Rather than fight your girl as she starts her mini rebellion, encourage her soul searching by offering up this Tween Warrior Huntress Costume as a tribute of your support. We bet she’ll ease up (not to mention thank you a bunch of times and tell you you’re the coolest! In the privacy of your own home, of course) and even start stepping up as a big sister a bit more. But you may want to grab her a bow and arrow ASAP, because if she wants a taste of true independence, she'll need to find her own food and also, probably watch her back while wearing this costume. Life ain’t easy out there. Even though the living is rougher (turns out, she really liked the way you made her bed), she will look phenomenally fierce in this long-sleeved minidress. Styled over these (sold separately) black leggings and these shoes that she can run, jump, and do her laundry in, this costume will help your little lady side-braid her way into independence one day at a time. After all, surviving on her own shouldn’t be too hard, once she learns the secrets to hospital corners and how to boil water.